Blogging is really a profitable online business that peoples like to do these days. If you think blogging is easy nowadays them you are completely wrong. As I said, it's a profitable business that because there are so much competition in blogging. So the question is how can you stand out and become a successful blogger. There are so many things on peoples talk about to get success in blogging. But, most of the guys forget the very important thing like Skills. Having some useful skills can help you in growing the blog. That's why in this article I'm going to share with you. 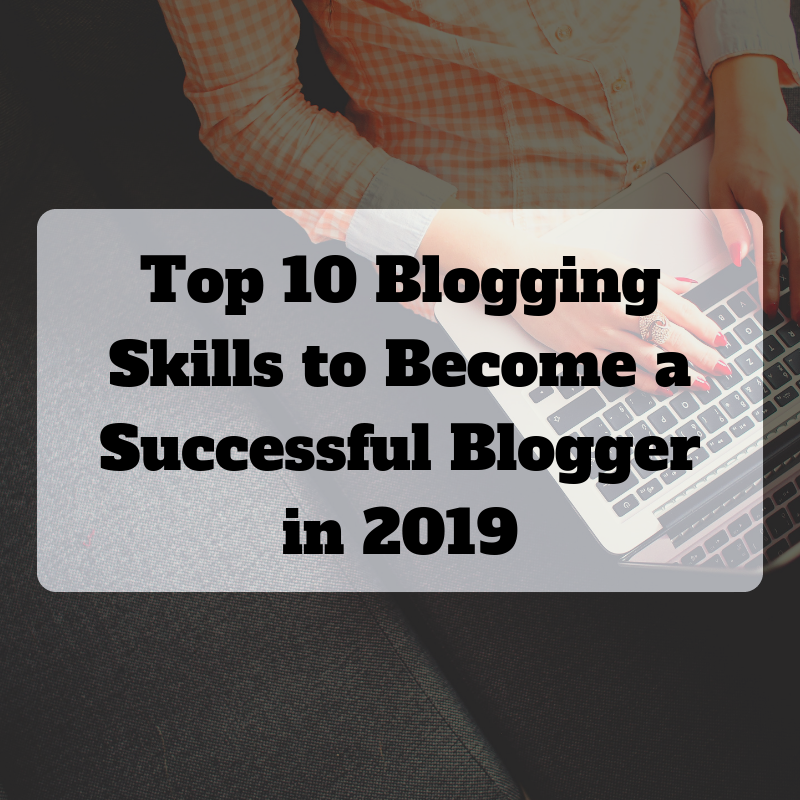 Top 10 blogging skills for blogger in 2019 and beyond. The most important skill required to become a blogger to write well. You don't need to be an expert in writing. Blogging is all about writing better content that useful for the readers. If your blog post connects and engage with the audience then blogging is definitely for you. But, most guys don't like to write even more than 500 words article. I am not saying that I'm a good writer even I don't know how to write a well. I haven't imagined that someday I will start a blog and write more than 2000 words articles. But, I started a blog and writing too. So, if I can do this then probably you can too. If you want to increase your writing skill then first you need to focus on writing at least 10 blog posts. So you will be addicted to writing. Study at least 1 blog post of others every day and see how they formatting and writing article. A blogger should have search engine optimization skill to rank their blog posts. SEO helps in to get free valuable traffic from a search engine like google. Without knowing SEO you can not optimise your blog for search engine. You should have at least SEO skill to optimize title tag and meta description of your post to get found in google. There are two types of SEO's On-Page and Off-Page SEO. It's very easy to optimize On-Page SEO and you can do it yourself with little practice but for the Of-Page SEO you required lots of practice and experience. if you want to learn about SEO then follow blogs like neilpatel.com, backlinko.com, searchengineland.com and bloggingspark.com. I also write posts related to search engine optimization. It's really important to have beautiful graphics designs on your blog. Because peoples don't like to read a blog post that has no images. You should have to add stunning graphics images within your blog post to stick your audience around your that post. For this, you need to be little graphic designing skill that helps you in to create images for blog posts and social media accounts such as post image, Instagram post, facebook/youtube cover, thumbnail, Pinterest pins and infographic etc. I have a perfect free tool that helps you in to create all of these. Canva is an online image editing tool that allows users to create stunning images directly in the browser. These days, videos are more popular than text. Peoples are attractive toward video content more. That's why bloggers started focusing on youtube and promoting their services. So a Blogger need video editing skill to create interest videos. If you want to earn money online from blogging then marketing is really important. It helps you to promote and grow your blog over online. A blogger should have marketing skill to be get success in blogging. This type of skill comes from over time the experience. If you want to learn this skill first you need to market your blog posts through all the mediums. So you will able to learn how to market your blog in future to various platforms. HTML/CSS are the basic coding text that on blog design runs. As a blogger, you should have the basic skill of coding don't need to be an expert. Having knowledge of HTML/CSS will help you in to edit your blog design and implement things like verification codes, ads code and banner codes etc. I personally have little knowledge of these coding text because I have tried to learn HTML/CSS coding. If you really want to learn this then go to this website w3school.com. This site will help you to learn to code easily with real-time examples. Networking is also playing important role in blogging. If you think blogging is all about writing and posting articles then you are completely wrong. To grow in blogging a blogger should have to build the network with like-minded peoples are already existing. Having a network with other bloggers like you can help you in to grow your presence over online. Building networks with other bloggers like you can also help in your hard times. A blogger should have also the skill of social media marketing. As you already know social media is so popular these days peoples using it too. So bloggers targeting social media to get traffic and leads. If you want to grow your blog then you should have skill in social management. It's very easy first you need to try out all the social platforms to find out how can you grow your blog on these platforms like facebook, twitter, Pinterest, Instagram, LinkedIn and many more. You can also follow the socialmediaexaminer.com to learn social marketing. As a blogger, you should also have to communicating skill. When you will interact with your peoples in the real world like seminars, meet-up, Submission. Communicating skill also need at the time of creating webinars and youtube videos. These things webinar and videos play a very important role in the blogging industry. Because these things create more loyal followers that help you to grow your business. Do you know the most important things in blogging? You should have to work hard there are not many ways to get success in blogging. When I started blogging, I also believe its very easy to become a successful blogger. But suddenly after few months of blogging. I have realised is not easy. I need to work hard and you too. Patience, most of the guys even don’t have the patience for like 3 or 4 months to work for free. But do you know most of the bloggers have not earn a $1 dollar within their first 6 months of blogging. So you should have patience in blogging to be get successful. You should have keep motivated in the blogging industry because sometimes days are bad. But you need to motivated to continue. So work hard keep patience and be motivated in blogging. I hope this post was helpful for you. If you have any question and suggestion then please let me know in the comment below.